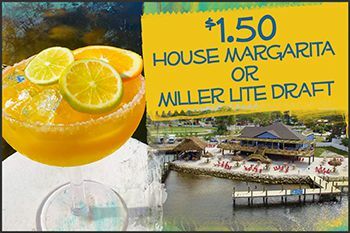 $1.50 House Margarita Or Miller Lite Draft - Limited Time Only! Join us at Whiskey Joe's for $1.50 House Margaritas or Miller Lite Draft with the purchase of an appetizer or entree! *Available 11/12-11/22 Monday to Thursday only. With the purchase of an appetizer or entree. Maximum 2 per person. Not valid with any other promotions.